Two years ago we formed Shirlington’s first-ever civic association to give our community a voice in Arlington County affairs. Participating in May 17 Jennie Dean Park Historic Marker Installation and new AFAC Office Tour Right to Left: Marion Jordan (Windgate 1), Caroline Haynes (Parks & Rec. 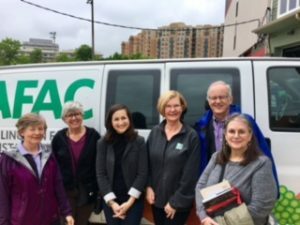 Commission Chair), Katie Cristol (Arlington County Board member), Edie Wilson (Shirlington Civic Association President), John Vihstadt (County Board member) and Virginia Farris (SCA Board member and 4MRV Alternate). With 2,200 households in 8 homeowner associations and 3 large rental buildings, not to mention WETA, Signature Theater, Energy Club, Animal Welfare League, and the Arlington Trades Center, and all the office workers, small businesses, and merchants in the Village, we form a vibrant, cohesive urban village and extended community that is the envy of many. But you know all that. Gave media interviews and presentations about Shirlington. So join us please! Our meetings are open to all. 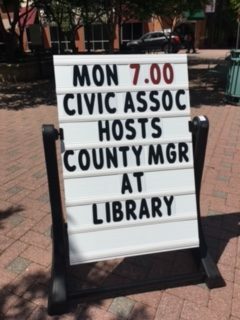 They now take place at the Shirlington Public Library on the second Monday of the month, 7:00 – 8:30 pm. (But not in August or December!) See you soon, we hope. Commits our community to be responsible, educated and active stewards of the environmental well-being of this area of Four Mile Run. 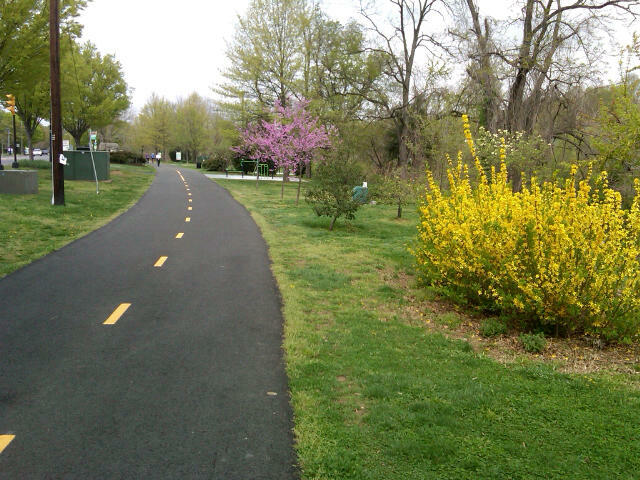 The Shirlington Civic Association (SCA) welcomes the opportunity to renew and improve the industrial, park and recreation areas offered by a County-mandated long-range, comprehensive planning exercise led by the Four Mile Run Valley Working Group launched in 2016. We participate actively on that body. The purpose of this resolution is to provide input on the Shirlington Community Canine Area (SCCA or Dog Park). This is not simply a park “for dogs” and thus a ‘diversion’ of county resources as some seem to think; it is a hugely successful park for Arlingtonians with their dogs. Tens of thousands of County residents come to walk along the stream, to enjoy the scenery, to share our love of dogs. People also come to enjoy a vibrant, diverse community where long lasting friendship are formed and people of every age, income group and heritage find companionship. The Shirlington community is aware of initial master plan proposals presented in two successive 4MRV Working Group meetings in February. Several of these would relocate the dog park, reduce its size, and place it within Jennie Dean Park near the playground, picnic areas and ball fields. The Shirlington community would like to go on record that the Dog Park in its present form and location provides an asset with unique attributes for local and County-wide residents and is vital to our local economy. Its location is close to residents, including the amenities of the Village at Shirlington, but positioned well away from residences and businesses. The current location between warehouses and the stream and opposite the Trades Center also buffers the inevitable noise of barking dogs in a manner that would not be possible in other proposed locations. It is fully-handicapped accessible, including parking and pathway. The physical separation between a multitude of large and small dogs to the west and the children, ball players, families and picnickers with food in play areas of Jennie Dean to the east provides protection for both dogs and people. 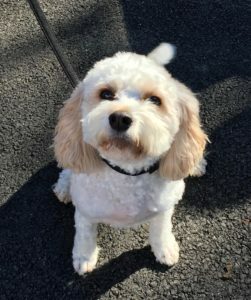 Arlington County requires that each dog park have active volunteer participation, the only kind of park with this requirement. To contribute to this governance and maintenance effort, the SCA has for the first time designated two representatives from our civic association to the Board of the Shirlington Dogs II. These representatives will report to the Association as needed and help us provide more support and effective two-way communications. We hope other nearby civic associations will do the same. Our community is well aware that the Dog Park and Jennie Dean Park are located in a Resource Protection Area, one that has in our view been neglected for many years. We hope that the 4MRV planning effort will result in substantial improvements in the overall environmental health of the valley. Indeed, it should be noted that the dog park has already contributed substantially to this. Until it was created by volunteers out of a dumpsite, chemical and trash dumping along this section of the stream was common in the 4MRV industrial area. At present, the County’s monitoring reveals that bacterial levels are higher above the SCCA than below it, and that the pollutants are primarily manmade discharges and spills as well as pollutants carried to the stream by passing across impervious surfaces from all over the County. This is why we would like to turn the discussion about the dog park from relocation inside Jennie Dean to how it can be improved and protected in its present site over the short- and long-term. This would include increased storm water management and erosion control, protection of mature trees, and stabilization of the stream bank. We would like to develop a set of practical, affordable actions that can be taken, beginning as soon as practicable. We do not want to see the perfect suddenly become the enemy of the good in this effort, leading to closing the dog park along the stream when the County is not in a position to offer a comparable area. 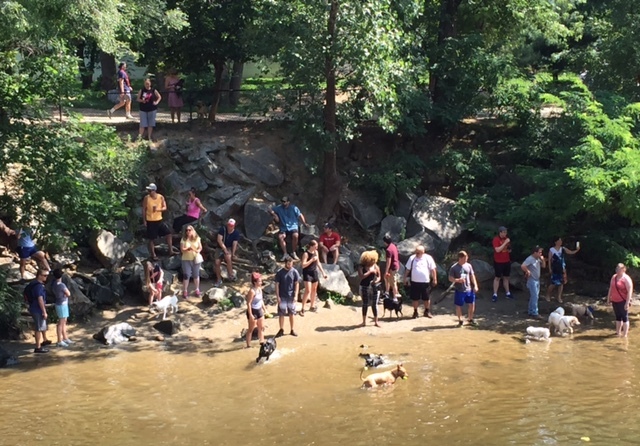 How will Four Mile Run Valley planning affect the Shirlington dog park? Will it stay in its current location? The SCA certainly hopes so. We are advocating for that vigorously on the 4MRV Working Group, but we are all waiting to find out. Here’s the latest, including the full text of Feb. 10 letter from the County Board. To learn more and make your voice heard, please come to the SCA Membership Meeting on Wednesday, Feb. 22, 2017, at the Shirlington Public Library. We have invited Keith Fred, the longtime head of volunteers to the dog park. The meeting starts at 7 pm. Keith is a member of the 4MRV Working Group, where he has been a knowledgeable and thoughtful voice. At the meeting, we will consider a resolution to keep the dog park in its current location. We will also appoint two Shirlington representatives to the board of the dog park support group to help strengthen it. We are encouraging other civic associations to do the same. We will post more on this important topic after our meeting. Suffice it to say that the SCA understands the role the dog park plays in our local community, economy, recreation, and well, how we live in Shirlington. In the week of February 6, 2017, there was a 4MRV meeting and during that week, over 150 residents from all over Arlington wrote the County Board members protesting draft plans presented to the 4MRV Working Group. Several of these plans would move the dog park inside Jennie Dean Park. Here is what Keith said on Shirlington Dogs list serve about the 4MRV meeting, followed by the Feb. 10 letter from County Board. Thank you to everyone who attended the Four Mile Run Valley Initiative Working Group meeting Tuesday night Feb. 7th and especially to those who stayed and spoke during the public comment time at the end of the meeting. You all added a very important and wonderful personal aspect on the importance of the Shirlington dog park. For those who could not attend I will give a brief overview. County staff and consultants gave a presentation as part of the Park Master Plan, which includes Jennie Dean Park, Shirlington Park as well as the dog park, showing four alternatives for the space. The presentation is posted on the Four Mile Valley web site, (www.4MRV.com) under “Documents.” Three of the four alternatives show the dog park moved to another location in the planning area and significantly decreased in size. The fourth has it mainly in its current location but somewhat decreased in size. The first three alternatives would also change the character of the dog park by not having its long length which allows people to walk along with their dogs as they run and play and spreads people and dogs out within the park. The first three if not all the alternatives would transform the dog park into something similar to the James Hunter dog park in Clarendon with artificial surfaces that have proven to be problematic especially in the heat of the summer. As a member of the Working Group I spoke as long as allowed in defense of the dog park in its current location and configuration and rebutted the objections to the dog park relating to the environment, erosion and storm water runoff. I mentioned the importance of the small dog area which most of the other county dog parks do not have. I emphasized how popular the dog park is by just the shear number of visitors, over 200,000 people annually, and also how vital it is economically to the local community. Other Working Group members made statements in support of my arguments. 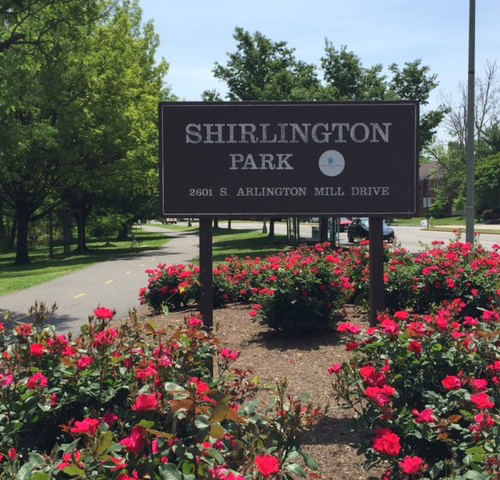 The public comments included how the Shirlington dog park is truly ADA accessible, that many people have moved to the immediate area specifically because of the dog park and people who live closer to other dog parks come to Shirlington. The staff and consultants are scheduled to present narrowed down alternatives at the March 7th Working Group meeting. Stay tuned. On behalf of the County Board, thank you for sharing your support for the Shirlington dog park. Please know that the Shirlington dog park is not going away. This park is one of eight Arlington County dog parks that residents and their pets enjoy. 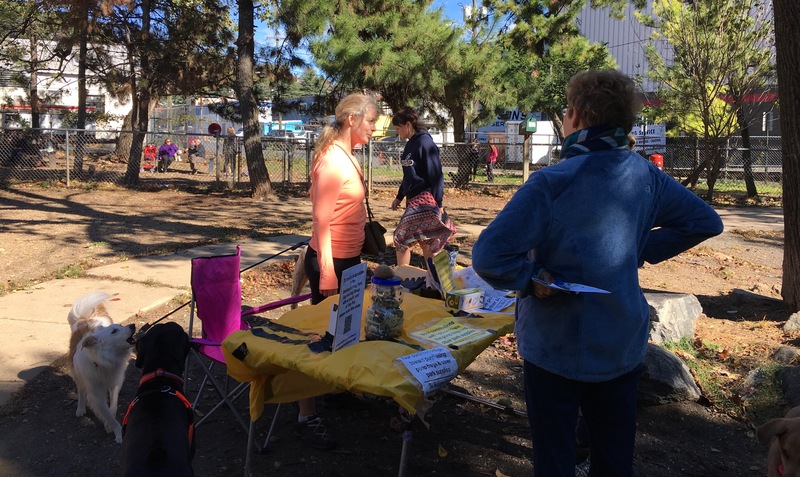 It is easily one of the more popular dog parks, and there are no plans to eliminate it. In fact, a key goal is to improve this feature for all concerned. As you may know, the County initiated a long a long-range, comprehensive planning effort of the Four Mile Run Valley in 2016. This area contains an eclectic mix of older industrial buildings, Jennie Dean Park, a variety of other uses ranging from the arts to athletics, and is one of the few non-residential areas of the County without a plan to guide its future development. The Four Mile Run Working Group is comprised of a broad array of citizen stakeholders. At a recent meeting of the Working Group, four initial master plan options of the study area were shared by the staff and consultants. The existing dog park was retained in two options, and it was moved and reduced in size in two others. The Shirlington dog park is located in a Resource Protection Area. Two of the options that would move the dog park away from the stream would allow the County to more closely adhere to the Chesapeake Bay Preservation Ordinance, which protects local streams and the Chesapeake Bay. We appreciate that many residents feel very strongly about not making any changes to the current dog park. The Working Group has yet to make any definitive recommendations, and the County Board will not make any final decisions until next year, in 2018. You may share your ideas about a vision for the Four Mile Run Valley and how to protect and enhance the dog park at the upcoming Four Mile Run Working Group meeting, on Tuesday, March 7, from 7-10 pm, in the Park and Natural Resources Operations Building’s second floor Conference Center, 2700 S. Taylor Street. There will also be more opportunities to engage in the public process for this project through additional public monthly meetings. We encourage you to attend to hear firsthand possible options for the dog park, other land use issues, and how they will potentially impact residents and visitors alike. You may also subscribe to email updates on the Four Mile Run Valley Initiative webpage. Your participation in the public engagement process is critical. As a community, we do our best work when everyone participates in a collaborative fashion. Thank you again for sharing your perspective with us. “More monkey bars!” said a 10- year- old Hispanic boy. His family was having a cook-out in Jennie Dean Park on Labor Day. I asked what they would like to have in a new and improved park. He was crisp and to the point. What would you like to have? It’s time to get serious about this question, because the County has at long last gotten serious about wanting to know. Shirlington residents need to speak up in the Four Mile Run Valley initiative aka “4MRV.” The SCA has prepared a concept paper with specific ideas. Please read and comment on it! Across the pedestrian bridge in Jennie Dean Park, and also in Shirlington Park along Arlington Mill Drive lie the only nearby green spaces for our 2,500+ Village and association households. This includes the only adjacent playground for our kids, the only walking trails for everyone, and of course the dog park. Technically these spaces are in the Nauck area, but we in Shirlington share them, help maintain and monitor them, and enjoy them every day. The 4MRV Working Group is now gathering ideas from all Arlington residents. The SCA concept paper contains specific suggestions about what we want and don’t want for the park areas. It was shared this spring at a membership meeting and is found on our website. The SCA team for 4MRV is Edith Wilson, Richard Adler, Ellie McCann and Virginia Farris. We need to know what you think so we can reflect that to the County. Please share this with your neighbors too. At the June 8th Shirlington Civic Association meeting, County staff presented an updated approach for improvements at the intersection of South Arlington Mill and South Walter Reed Drives. This was in response to questions posed by residents at the December SCA meeting and a subsequent letter from several area condo associations to the County Board. Valerie Mosley, Capital Project Manager in the Transportation division of the Arlington Department of Environmental Services, said the plan is in the design and engineering phase and is about 30% completed. The target is to have construction begin in the fall of 2017. Residents of communities along South Arlington Mill Drive continued expressed concern about some of the planned changes, most notably the reduction from two westbound left turn lanes to one lane at the intersection. They said exiting and entering their condo developments is likely to become more difficult unless other adjustments were made. County staff will respond shortly. 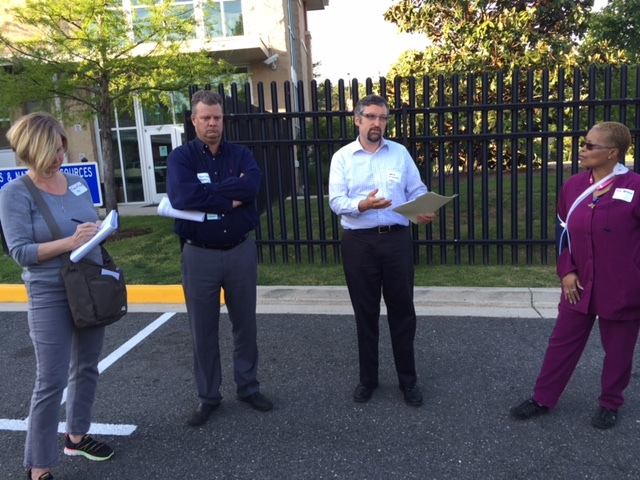 At the same meeting, Mickey Papillon, manager of Shirlington with Federal Realty, provided an update on the parking situation at the Campbell Garage. The confusing signage is being redone, and discussions are underway with those entitled to parking under the current agreement, approved by the County over 10 years ago, including Harris Teeter, Shirlington Library, Signature Theater, Delancey (UDR) rental apartments, Shirlington Village Condominiums, and Hilton Garden Inn. Federal Realty is working with the various stakeholders to create a fair and equitable solution regarding space availability and enforcement so that parking is not abused and that all the available parking spaces are available as much as possible to as many as possible. Note: Attend the June 8th SCA Meeting to review detailed transportation plans. On Dec. 2, 2015, the SCA was addressed by Ms. Valerie Mosley, Capital Project Planner with the Arlington Division of Transportation (DOT). She presented the concept plans for changes to Walter Reed Drive (WRD) and Arlington Mill Drive (AMD) and also Four Mile Run Drive (FMR). These changes have been in development for some time, even before the creation of the SCA last fall. The Arlington Pedestrian Advisory Council was represented at the SCA meeting by its chair, Dennis Jaffe, and Christine Ng, a Shirlington area resident who serves on this commission. The Council played a strong role in reviewing the proposals. The representatives of Windgate Villages II and III as well as the Heatherlea questioned the wisdom of changing Arlington Mill Drive to one left lane and one right lane at Walter Reed Drive. They believe this would make it more difficult for their residents to exit in the morning rush hour. They spelled out these issues in a letter to the County Board. On June 8th, the SCA will meet again with Ms. Moseley to see how plans have evolved. The purpose of this letter is to express our STRONG opposition to the Arlington traffic project that will result in the elimination of one of the two existing left turn lanes from South Arlington Mill Drive onto South Walter Reed Drive and to request a STOP ORDER on the project until a special hearing can be held on this matter. Although the project intention is to increase pedestrian and cyclist safety, it will result in adverse safety conditions for residents and pedestrians that must traverse South Arlington Mill as the main ingress and egress points for their properties. Shirlington community leaders remain actively involved and clearly recall that Arlington County DID NOT propose the removal of one of the two left turn lanes at the initial Town Hall meeting on March Il, 2015 held at the Fairlington Community Center. On September 23, 2015, we registered a concern with Arlington County regarding difficulties in making safe ingress and egress from our properties onto South Arlington Mill Drive due to the limited line of sight posed by vehicles parked along South Arlington Mill Drive. To make matters worse, the recent movement of the bus stop on South Arlington Mill, directly in front of Heatherlea’s main entry point, has also presented additional visual hazards, traffic congestion and increasing safety concerns that will be exacerbated by the reduction to one left turn lane and was not likely factored into the lane reduction analysis. During the Shirlington Civic Association meeting, held on December 2, 2015 at the Arlington Trades Center, we were all very surprised and alarmed at the County decision to remove this left turn lane. This will further impede the ability to make a left hand turn, resulting in even more hazardous conditions for drivers, pedestrians and cyclists. look forward to working with the County Board on this issue and discussing it in more detail during a hearing to allow the project to proceed in a way that is best for the communities it most affects. Finally! On May 17, the Arlington County Board appointed the Working Group for the Four Mile Run Valley (4MRV) Initiative. This too-long-awaited planning effort will focus on a large area including both park and light industrial areas. See the county homepage for a map and details, plus an excellent briefing book with information on zoning, stream restoration, environmental features, land ownership and more. The first meeting took place June 1 and there is a special walking tour on Saturday June 4. Everyone is welcome. Thanks to having its own civic association at long last and to its close proximity to the project area, Shirlington was given two seats on the Working Group. Board members Edie Wilson and Richard Adler will be the Representatives, assisted by Alternates Judy Hijikata and Ellie McCann. Both Judy and Ellie have lived in Shirlington for over 20 years and have planning and environmental backgrounds, which should be very valuable. Keith Fred, the longtime lead volunteer for the dog park, is also on the working group, as is WETA. To be clear, the study area is not in Shirlington. 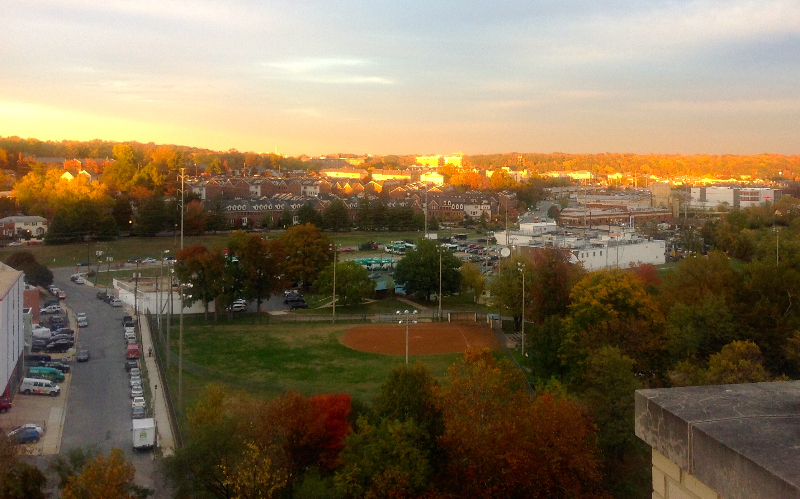 It lies, however, on the very southern edge of the Nauck Civic Association boundary, and much of the study area is immediately adjacent to the Village of Shirlington and the condos across South Arlington Mill Drive. This end of the valley is vital to Shirlington residents, supplying our only green spaces on both sides of our beloved stream and the dog park, not to mention the wide range of businesses starting with the Weeny Beeny down to the new brewery to the DMV and Dave’s Car Wash. We all know this area could stand some improvement. It’s easy to subscribe to the 4MRV homepage for news of meetings where the public will be invited to brainstorm. You can attend any of the Working Group meetings, which are being held in the County Trades Center conference center right in the middle of Shirlington. We want your ideas and experiences to inform this effort. What do you want this area to become? Representatives of the Shirlington and Nauck communities toured the Trades Center owned and operated by Arlington County and Arlington Public Schools. More than 500 employees from multiple county departments work in the 38 acre complex off of S. Arlington Mil Drive. Among the biggest challenge facing managers is space constraints resulting from the development of Shirlington and growth in demand for services provided by the center. Shown here are Kurt Louis (left) of Parks and Recreation and Kevin O’Connor, Department of Environmental Services, speaking to the group.